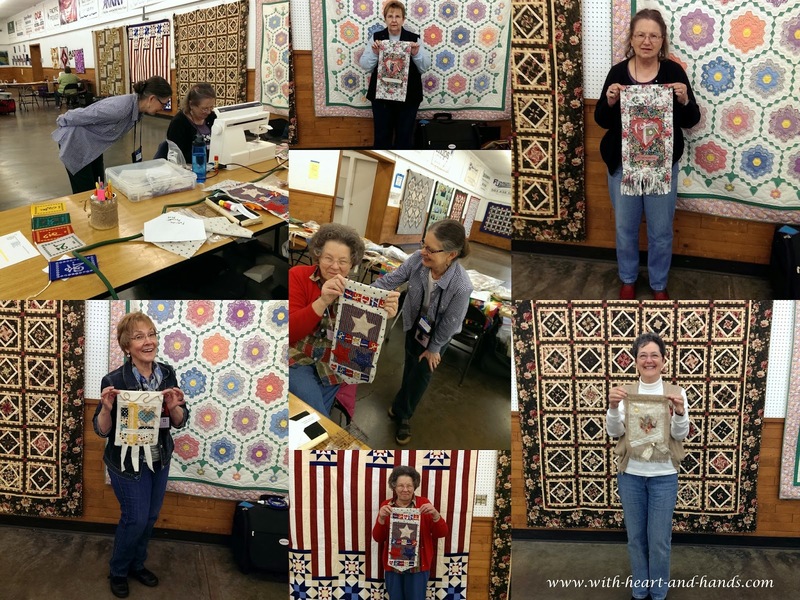 I had a wonderful time this week teaching a class on the making of "Peace and Prayer Flags, Garlands, Pennants, and Bunting" at the Polk County Fairgrounds in Rickreal, Oregon for our local Mid-Valley Quilt Quilt's "Quilt College". What a great group of women! Each and every one went 'outside of her personal' comfort zone in creating peace and prayer flags from my kits with directions to be as individual as possible. And they did! Every single one of these lovely ladies added something that was unique, creative, and different than my samples! 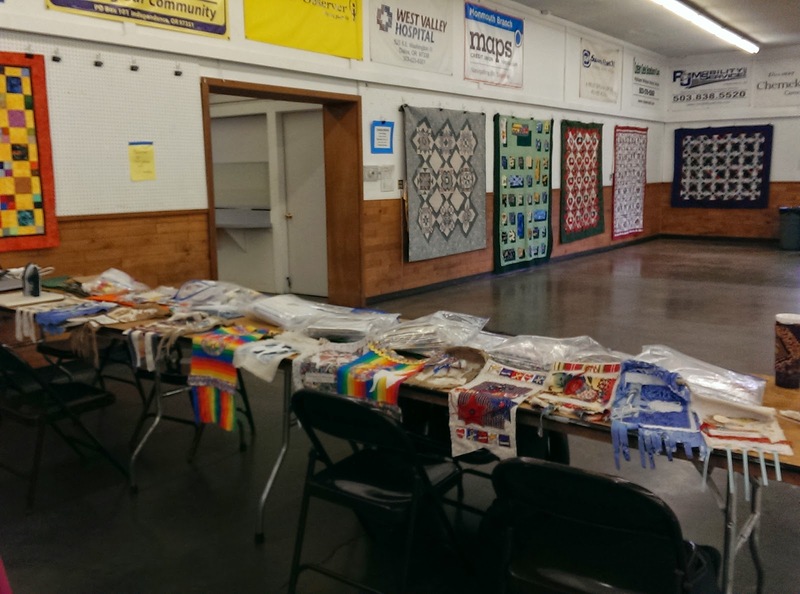 Quilt College is a biannual fundraiser and county fairgrounds space holder for our guild. 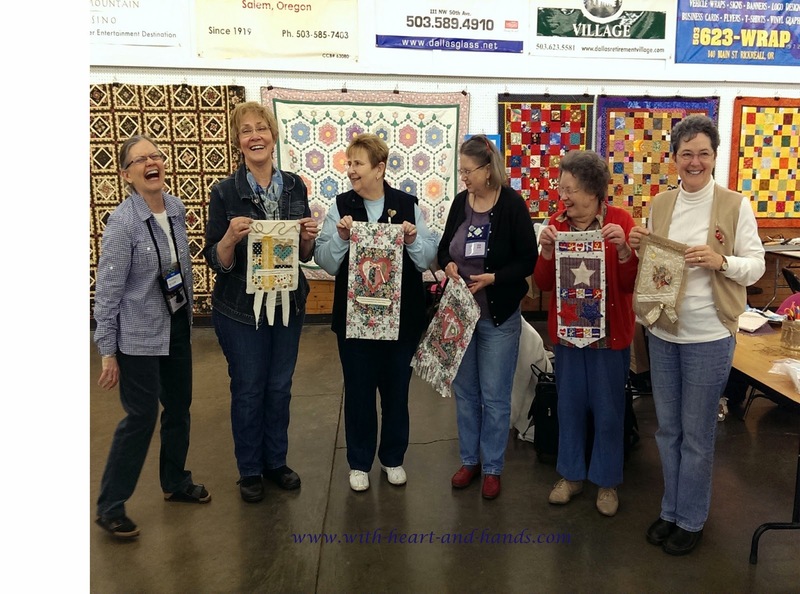 Without the donation of its teachers' time, and the support of the quilting community, we wouldn't be able to reserve the this space for our Mid-Valley Quilt Guild quilt show during our 'every other' years. We're fortunate to have been 'grand mothered in' the reservation of the space and work hard to maintain its yearly rental fee. So, when I heard this past January that a lot of teachers had 'dropped out' (for little reasons like they had quilts selected to show in Paducah ;-) I was quick to 'drop in' and offer to teach a few classes as my donation to our cause. We offered a great many classes over all, with at least a dozen running each day and I taught this one on Friday afternoon. I provided kits for 14 different peace or prayer flags and they had a wide variety of individual kits to choose from even among their favorite 'looks'. I provided choices that included patriotic, country, Victorian, rainbow 70's, religious, spiritual, just plain cute, and native cultures and traditions. But of course, I didn't tell them, what was what or give any advice on selection and being me, they could switch ingredients and ink jet quotations if so desired. Such fun! I made so many kits they filled a medium sized suitcase and sold each kit, with directions and a photo and all of the ingredients including trims for only $5, plus art fabric postcard kits for only 3/$5. I am a bargain hunter and like to share with others, so I lost money rather than made any and I taught the class for free but I was paid back in the joy of sharing with others and making some really nice new friends and getting to know each of them so much more! Community sewing and quilting at its best. Joining together, creating fun and lovely things, and filling up hearts and souls with love! It touched my heart to get to know these ladies on a more personal level and to feel the love of creating bring forth the power of intention and manifestation so women could receive what they needed from the power of the spirit flags! How much fun did we have? Just look at my face! And I can't even remember who said what to get me to laugh this hard! I truly allow myself to feel everything and allow only the good to remain in my heart...the best that I can! And even better....all of my students shared their prayer flags and their experiences creating them and going outside of their own creativity boxes during our very next Mid-Valley Quilt Guild meeting. I couldn't have been prouder as I watched them line up among all of the traditional quilters and share their experiences and their flags! 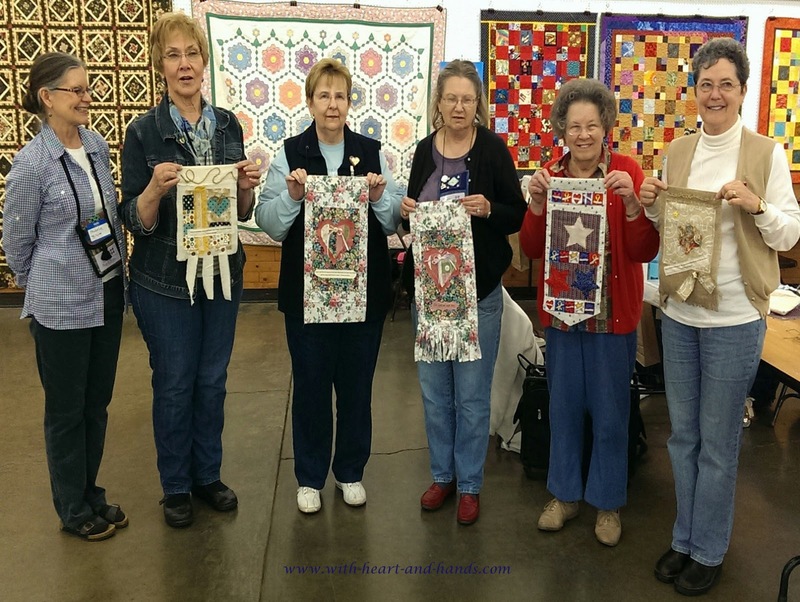 Community art, quilting, and prayer flag creation at its best! Wow, that looks like a lot of fun as well as being for a good cause. Great to see you laughing! Loved all the variety and creativity in the flags. It looks like everyone had fun. Bless you Michele and loved photo of you laughing. It looks like a great space (huge) to work in, and may next week be better. I love this post. I am happy that you introduced even more friends to prayer flags. I love the picture of you laughing! Pure joy! And it looks like your students are very proud of their flags.